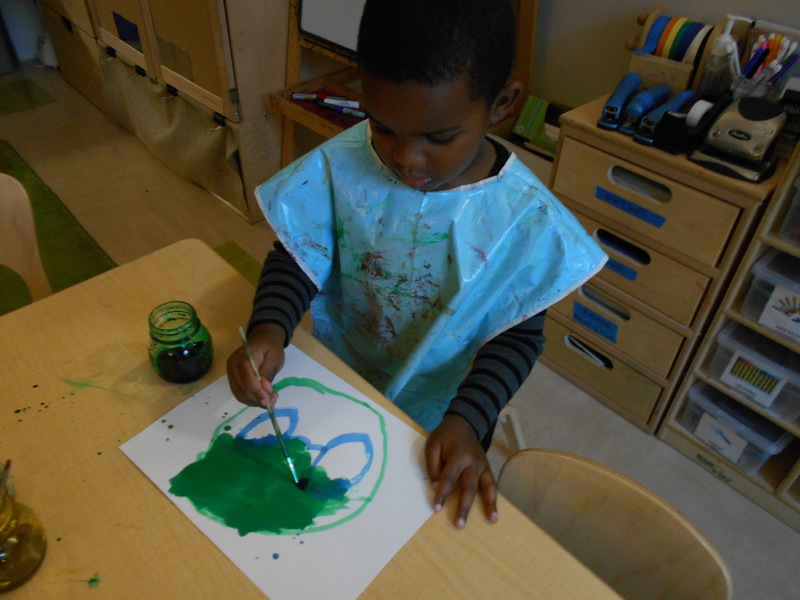 Liquid watercolors | Pre-K Art Stars! The Rose and Lavender groups have been hard at work in the Studio on wooden sculptures. Friends spent a week exploring wooden shapes and trying to figure out which pieces worked together and which didn’t. 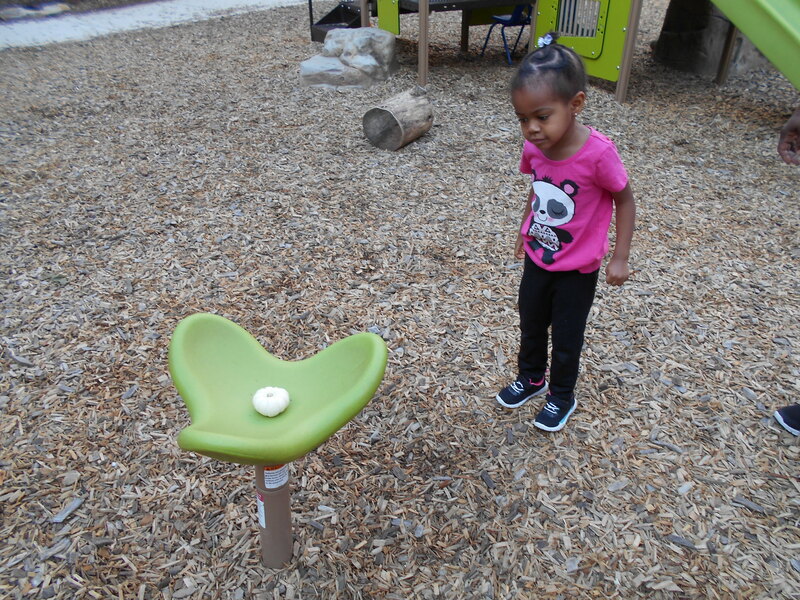 Children noticed that round shapes had a hard time balancing on flat shapes, but if both sides were flat, they could easily stick together. 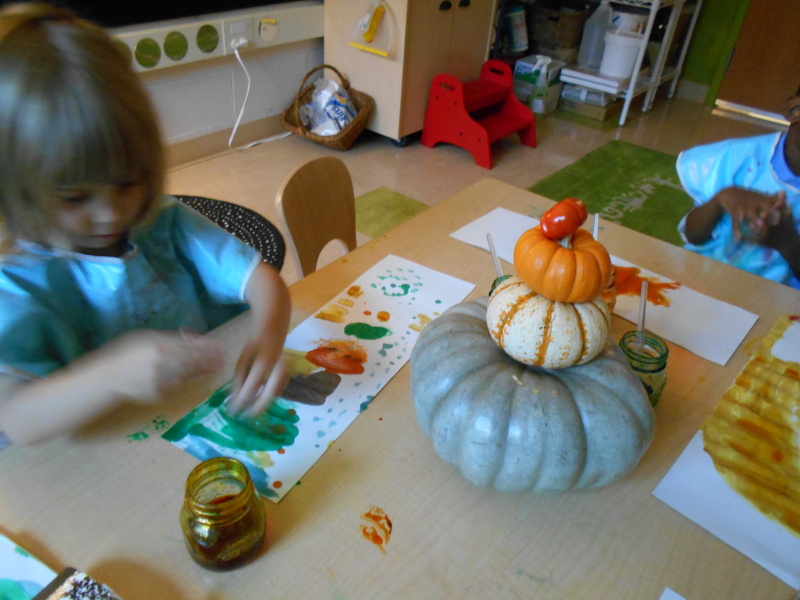 Next, friends used wet glue to adhere their pieces to create one or more sculptures! 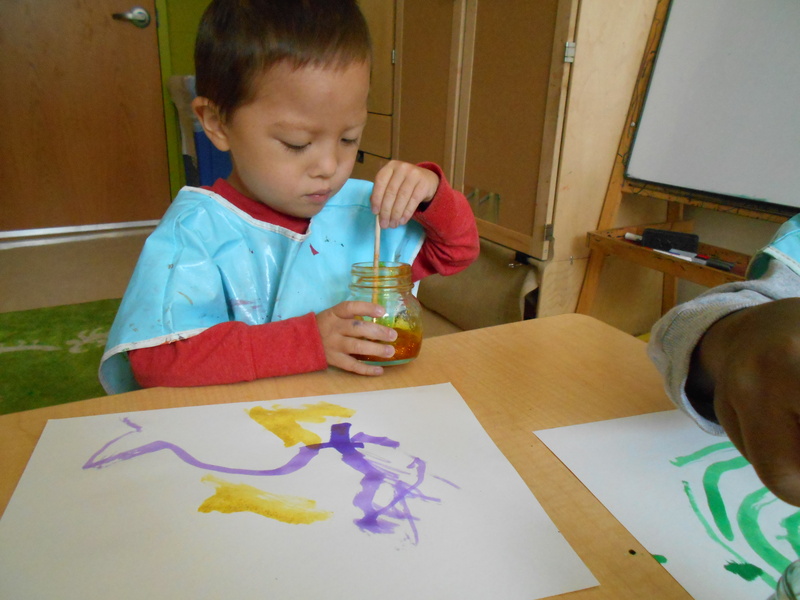 Eli: I can mix the glue. I can spread the glue. Jax: Wow, so cool. See, it can stand up! Konone: I don’t know what I made! Christian: The ring and the ball look like a planet from outer space! Bennett: I’m going to make a little kid. It’s my sister. No, no, I made a dinosaur with a spike on the back! Naomi: This piece looks like a bracelet! Kavalli: Whewwwwww, the ball rolls. Isabella: Wood feels cold, smooth and hard. 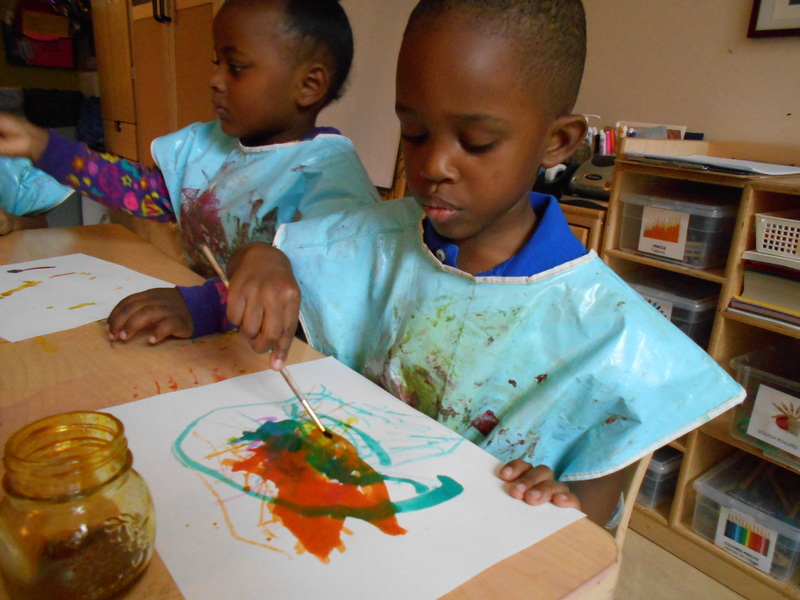 The following week, friends were excited to see that their sculptures were dry! 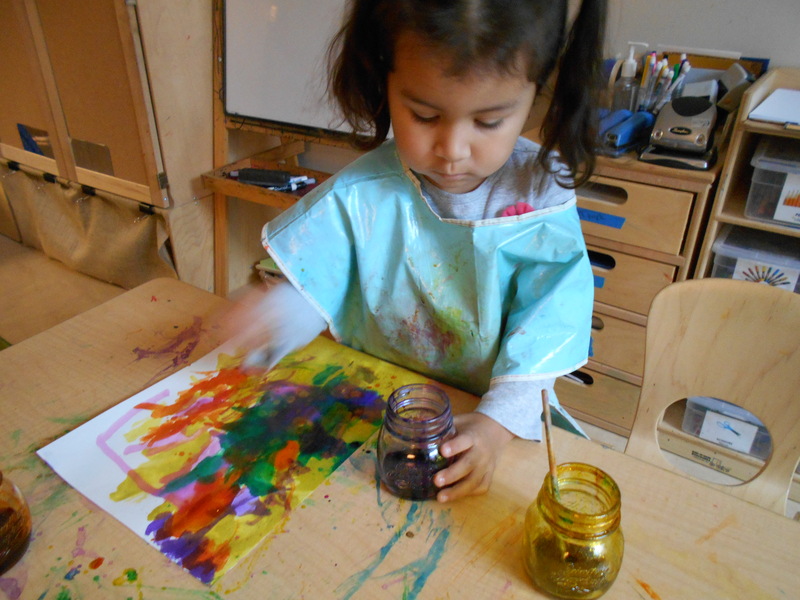 Children used liquid watercolors to paint their wooden sculptures. Cathy: My sculpture looks like Mars. Christian: My 3 headed monster! I missed him! I’m an artist because if someone is an artist, they just paint their sculptures. Yep, I’m correct. I’m an artist because I have to make him detailed. It’s so crazy, the paint is drying so fast! 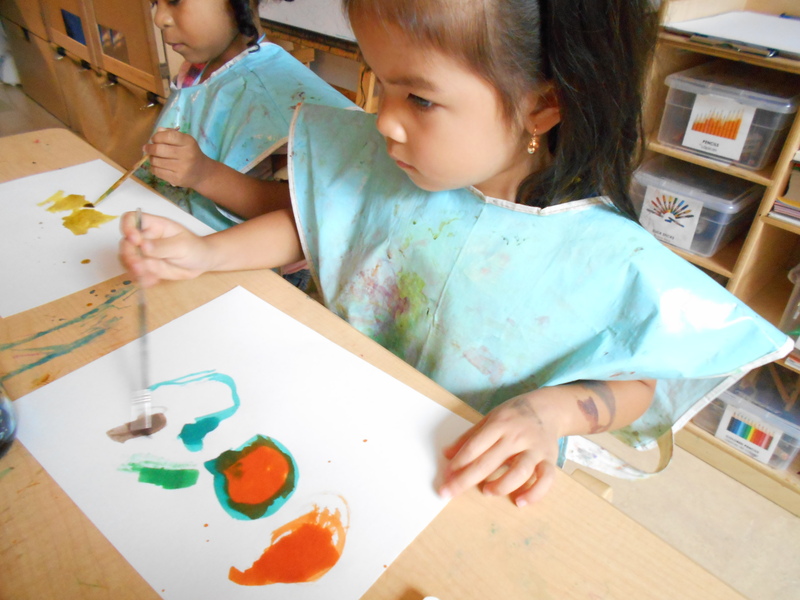 Siah: I’m painting it gentle so it wont break. Jariel: The paint dried. It dried fast. Kai: Look at me. I did this. 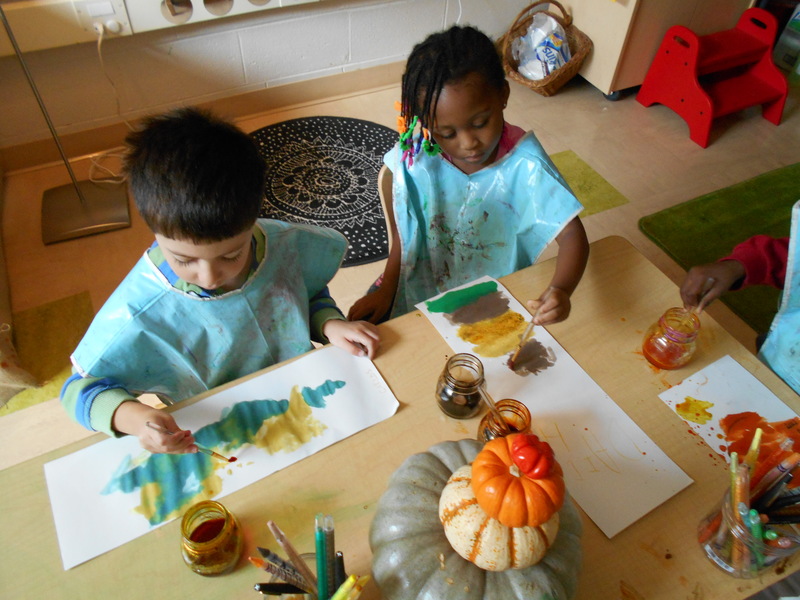 This week, friends worked on adding collage materials to our sculptures. 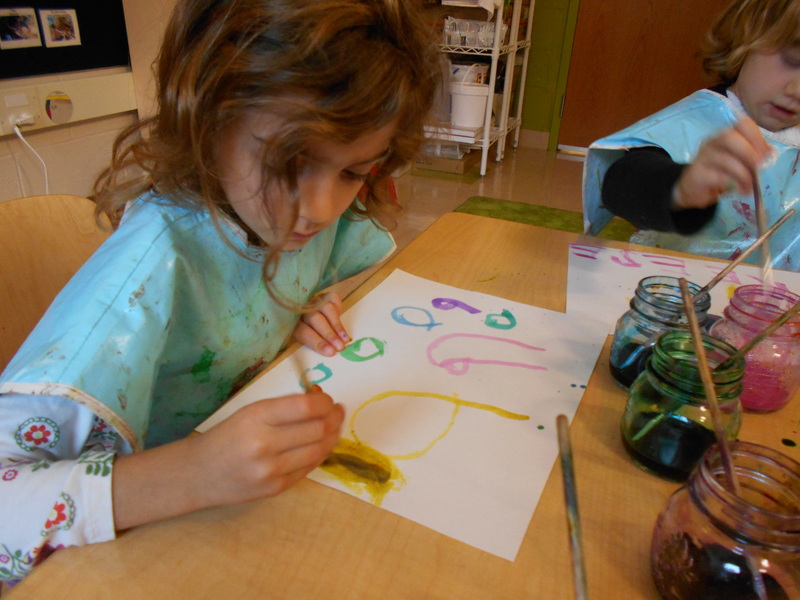 Children collected feathers, buttons, googly eyes and other found materials from the Studio to add to their sculptures. Kavalli: It’s an experiment. An eyeball fox man. Naomi: Cathy, look! This material is shiny. It can be the chocolate in the cookie. 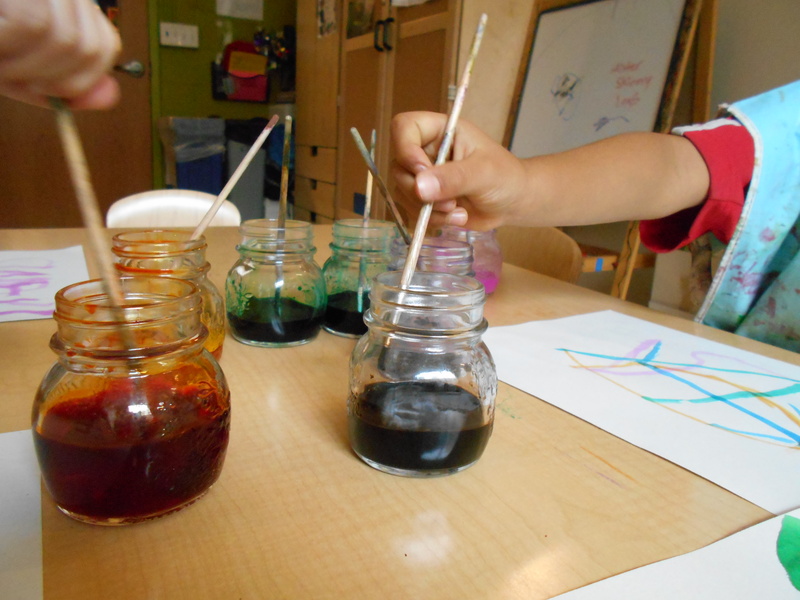 Phoenix: The glue is rainbow. Siah: A star! A sprinkle star! So pretty. Jariel: Mamma mia, stop sticking to me, you feather. 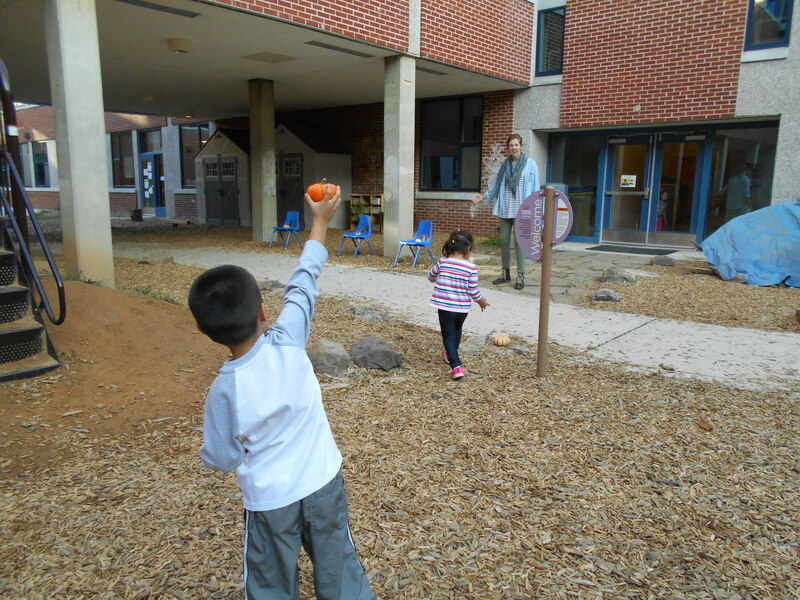 Last week, we kicked off our Pre-K expedition with a pumpkin explosion on the playground! 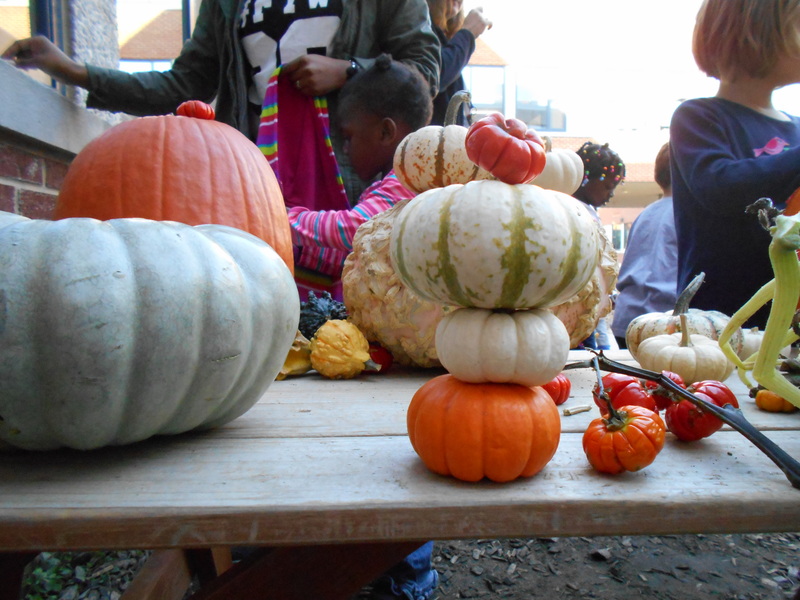 Children arrived at school and were surprised to see that there were pumpkins of all shapes and sizes everywhere! 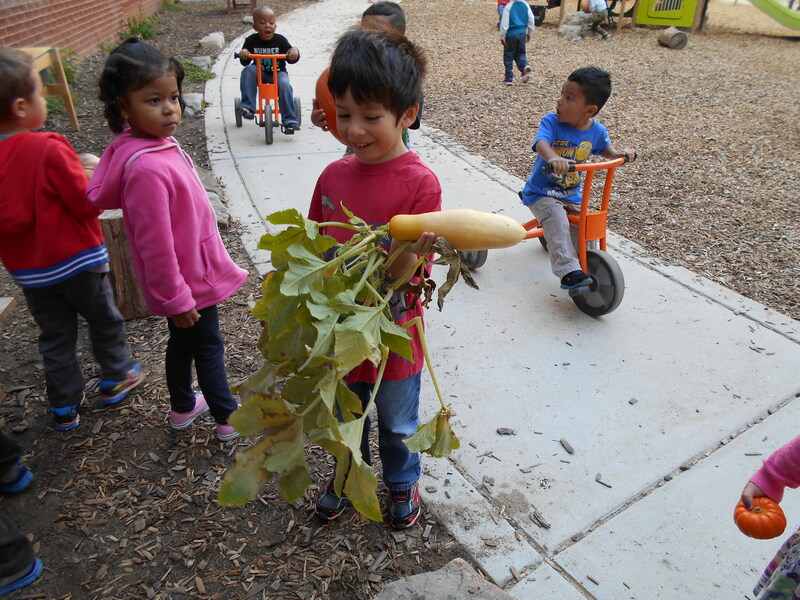 Briana: I found a pumpkin on a bicycle! Amen: I found something! A pumpkin! I need to find more. 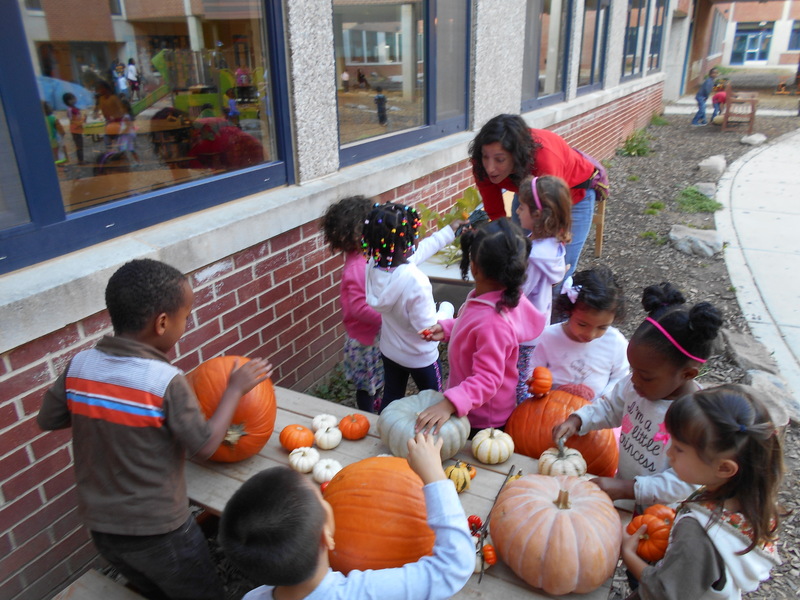 Mae: Instead of going to a pumpkin patch, our school became a pumpkin patch! 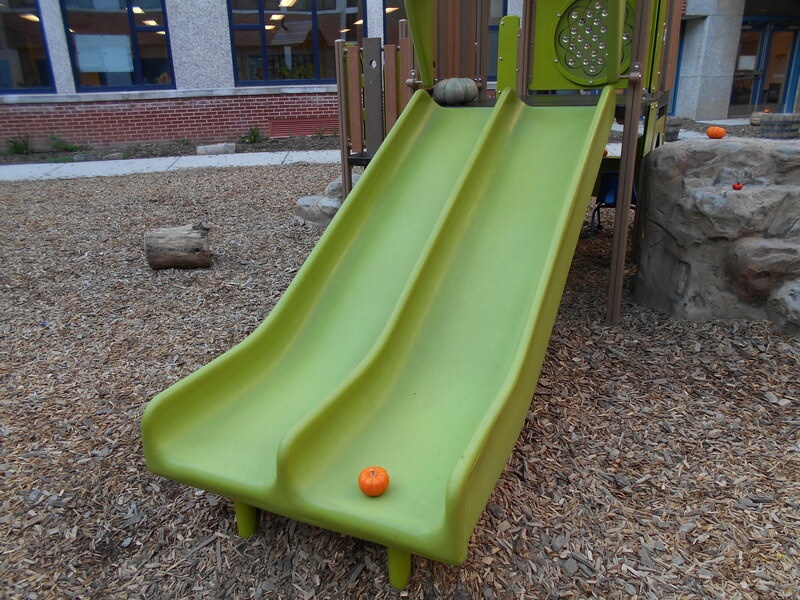 Friends noticed and wondered all sorts of things about the pumpkin on the playground. 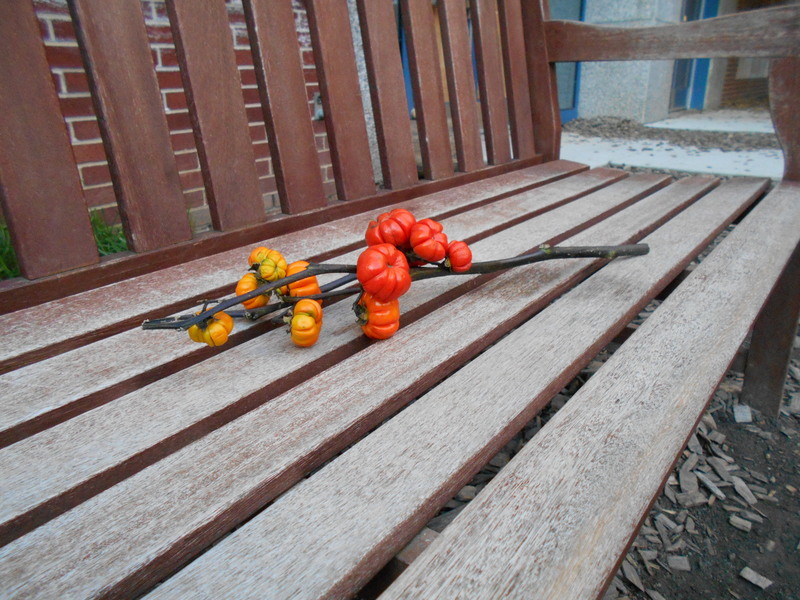 As children found them, they were asked to bring them to the picnic table so that we could explore them further. 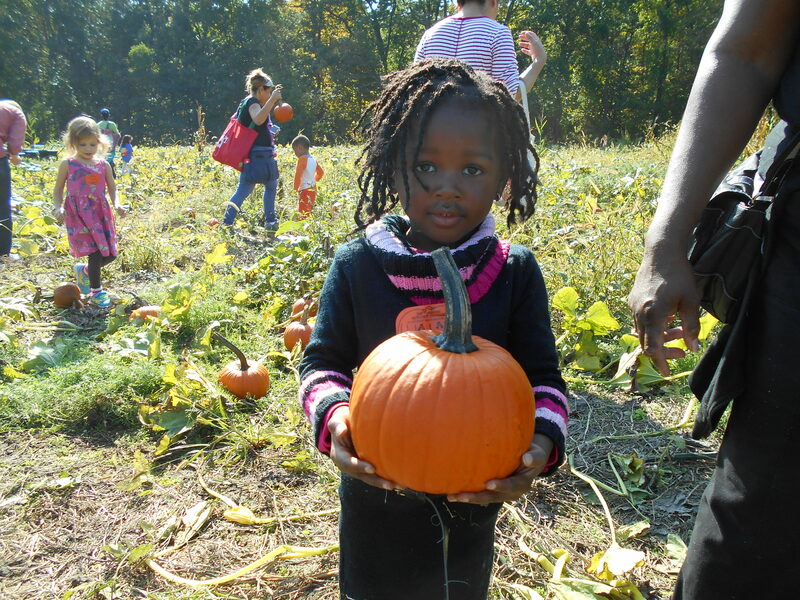 Waju: I have never seen a white pumpkin! Sarah: Is it an orange? Trebor: I want to smell them. I don’t know how they will smell like. 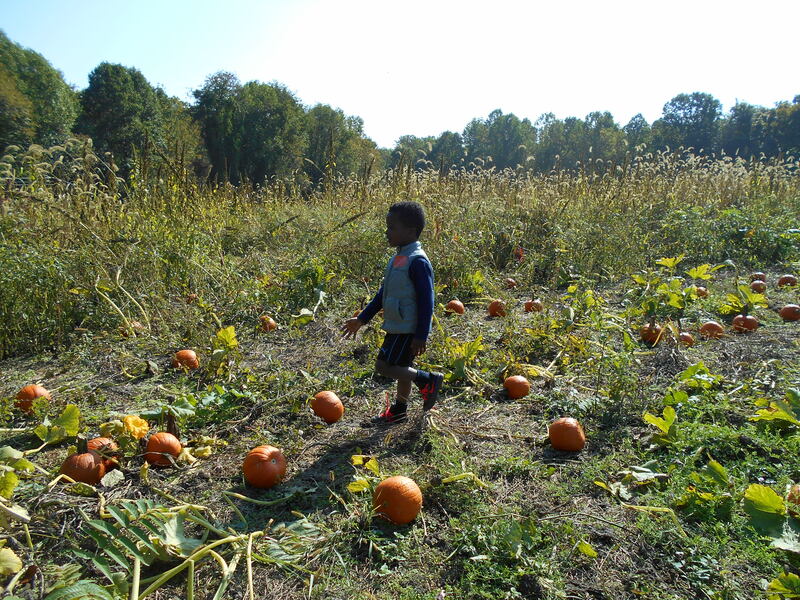 Ayub: Is this the pumpkins home? 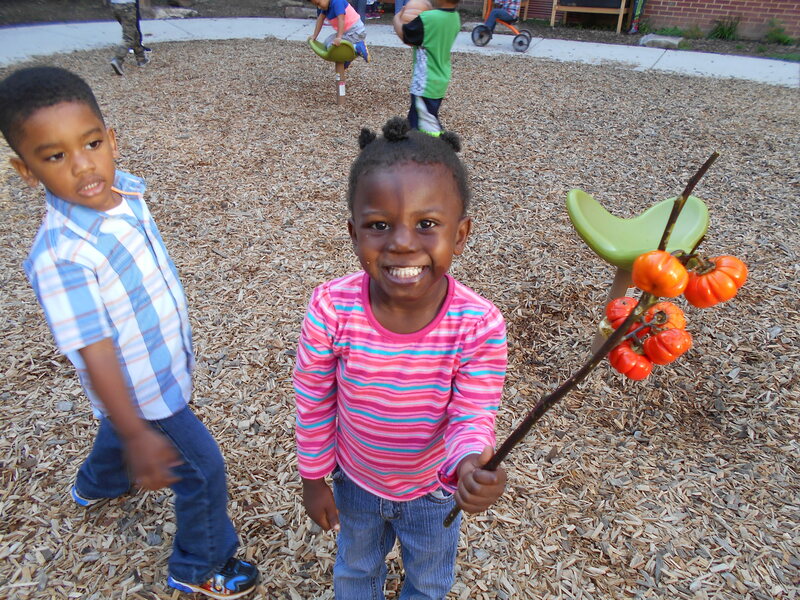 Ayub: The baby pumpkins on the branch look like marshmallows. Zeina: Yeah, it looks like roasting marshmallows on a stick! Elliott: I can make a snowman. 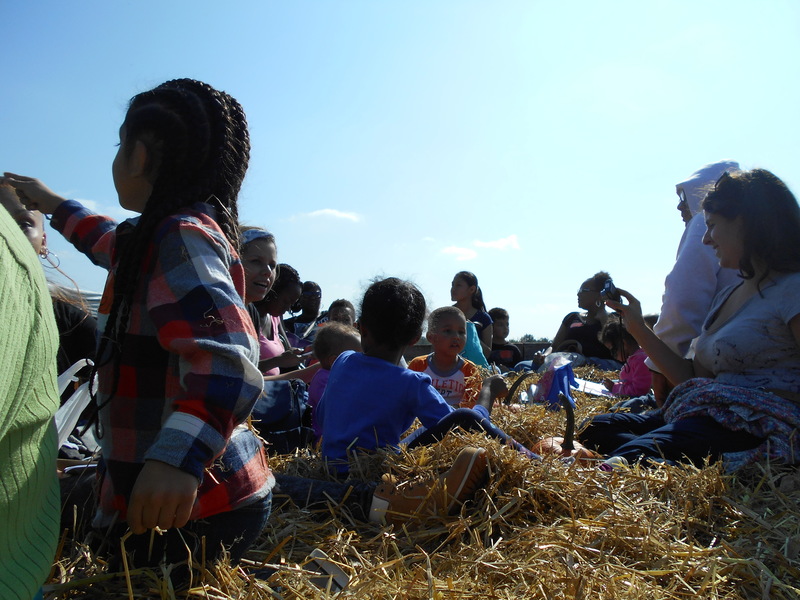 Next, all four Pre-K classes piled onto buses and we hit the road for Butlers Orchard to learn more about where pumpkins come from and what it means to harvest. 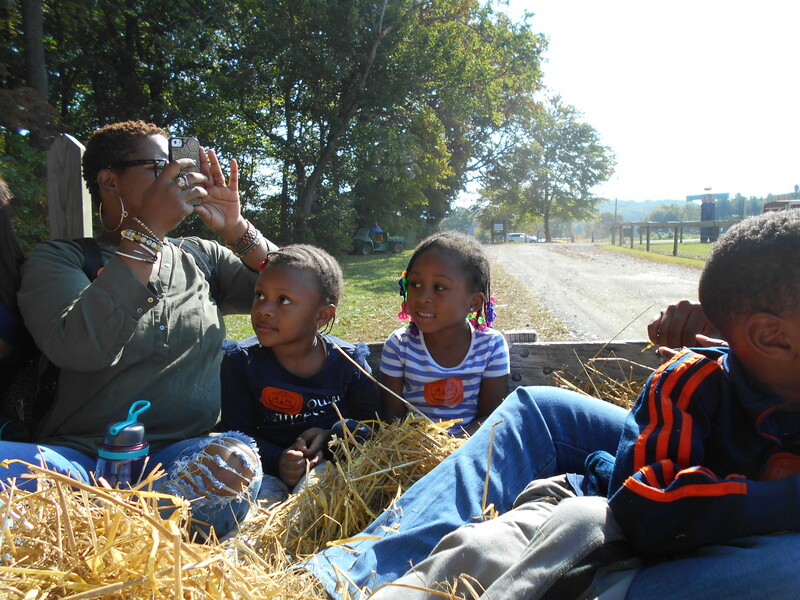 Bennett: Thanks bus driver for taking us to the pumpkin patch! Cory: This is a bumpy ride. Esther: It looks like a pumpkin party here! 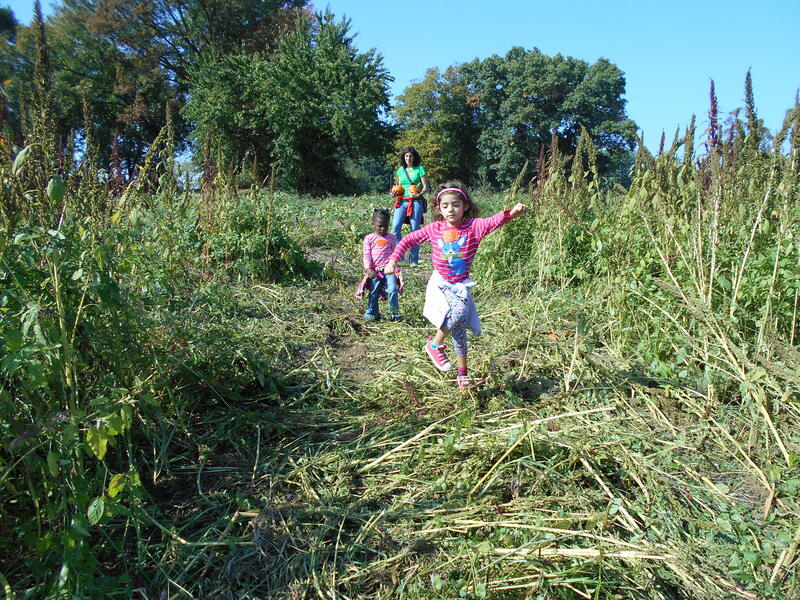 William: It’s really tough to walk through the vines at the mumpkin pumpkin patch. 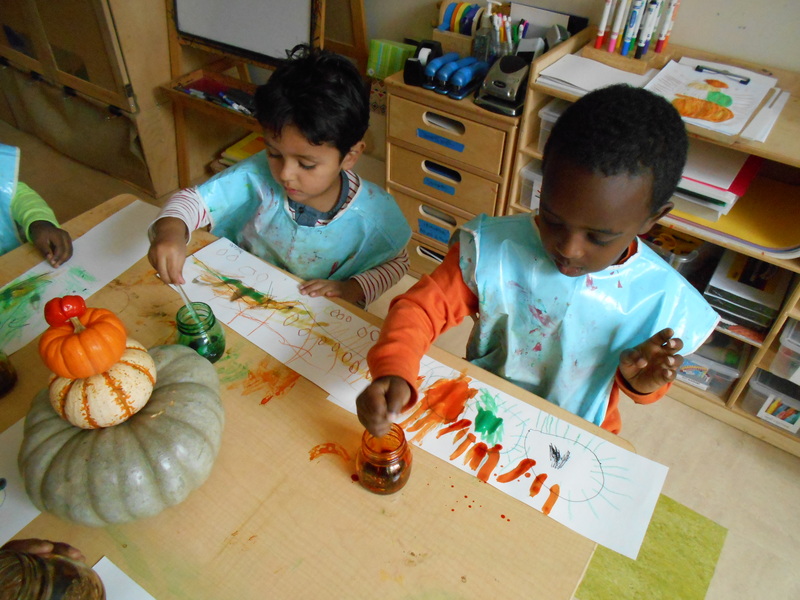 Waju: I think a porcupine ate that pumpkin! 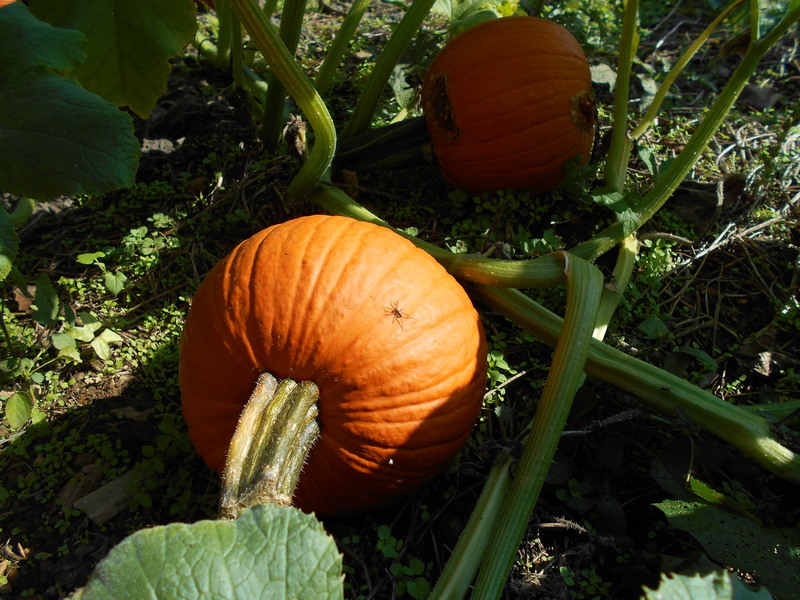 William: Lots of spiders on the pumpkins… ah! 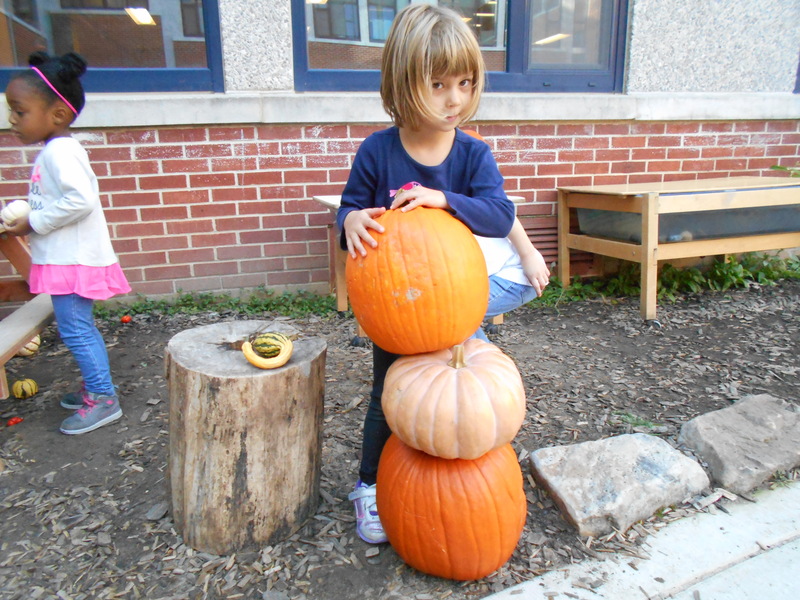 After the long weekend, friends returned to school and continued to notice, wonder and ask questions about the pumpkins. 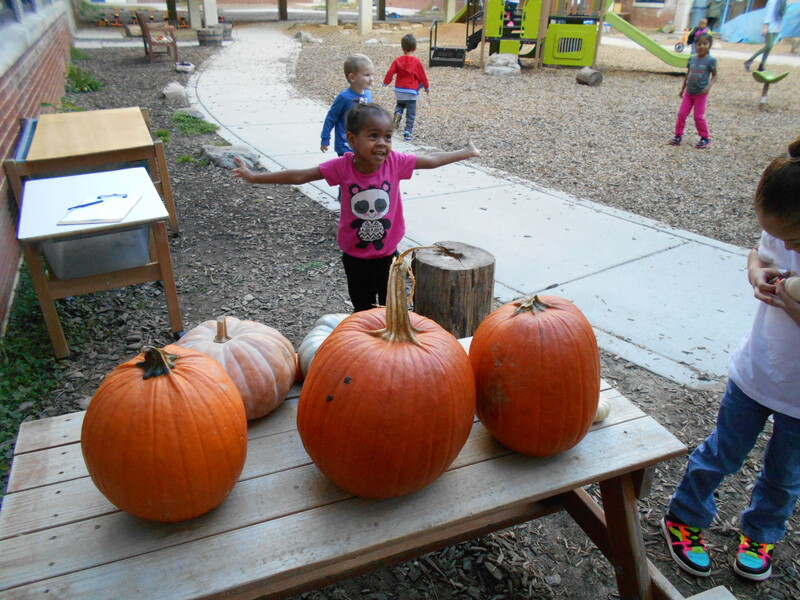 Children were ecstatic to see that pumpkins were still on the playground, in their classrooms and even in the Studio! Kavalli: Pumpkins in the Studio! That’s crazy! There’s more pumpkins! 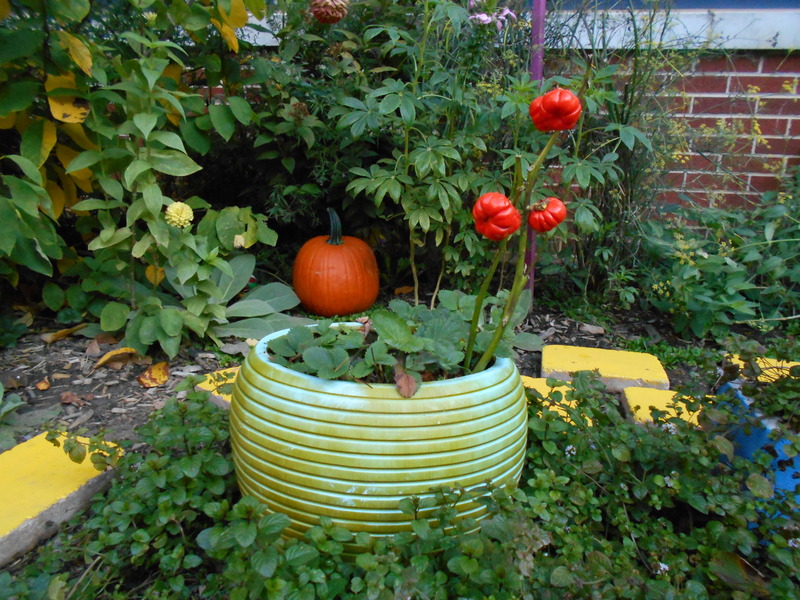 Pumpkins are everywhere! 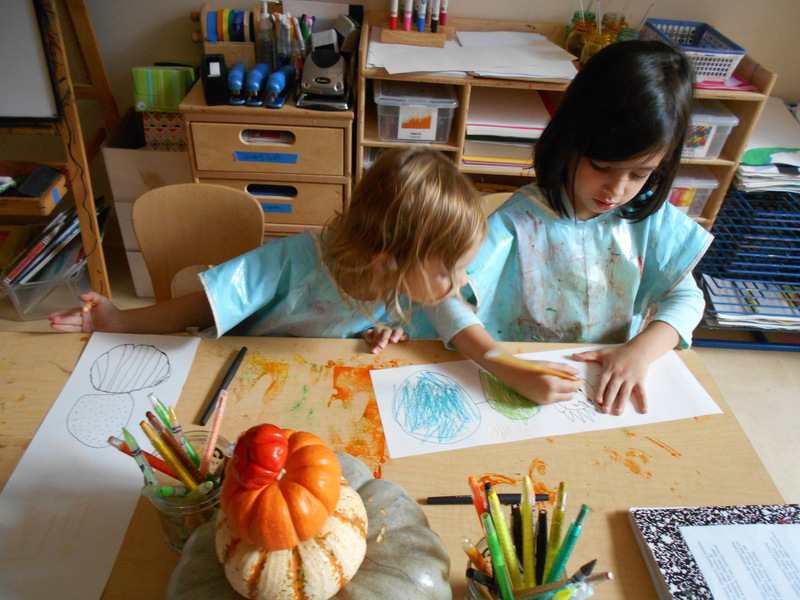 Friends used twist crayons to do an observational drawing of the pumpkins. 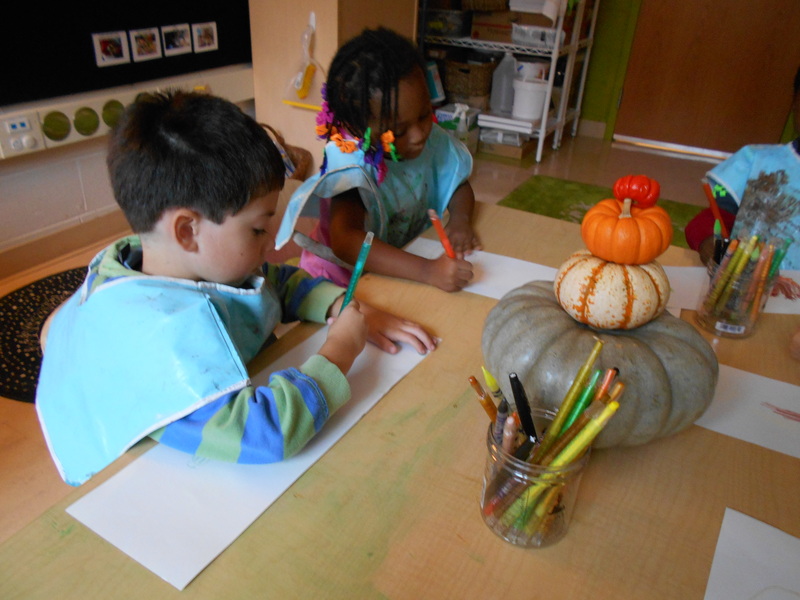 Children examined the color, size and texture of the pumpkins and gourds very carefully. 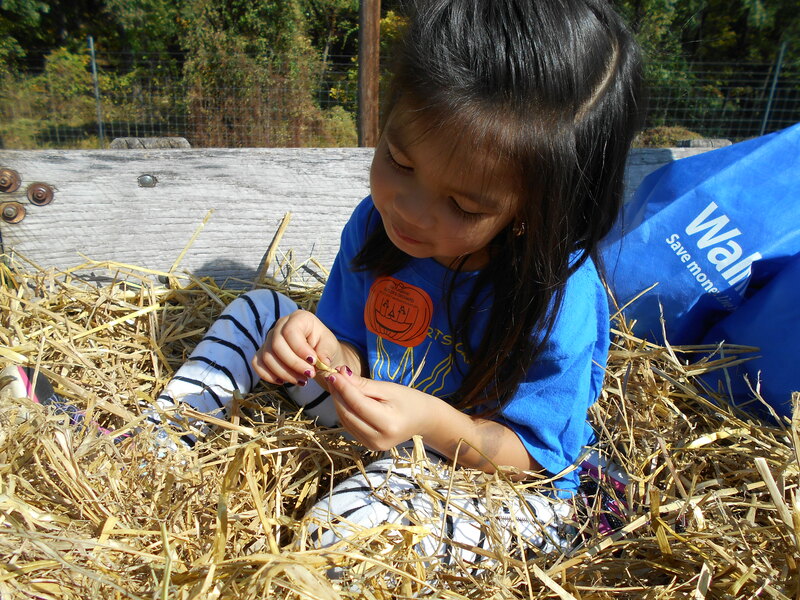 Carlos: I’m counting the pumpkins so I know how many to draw. 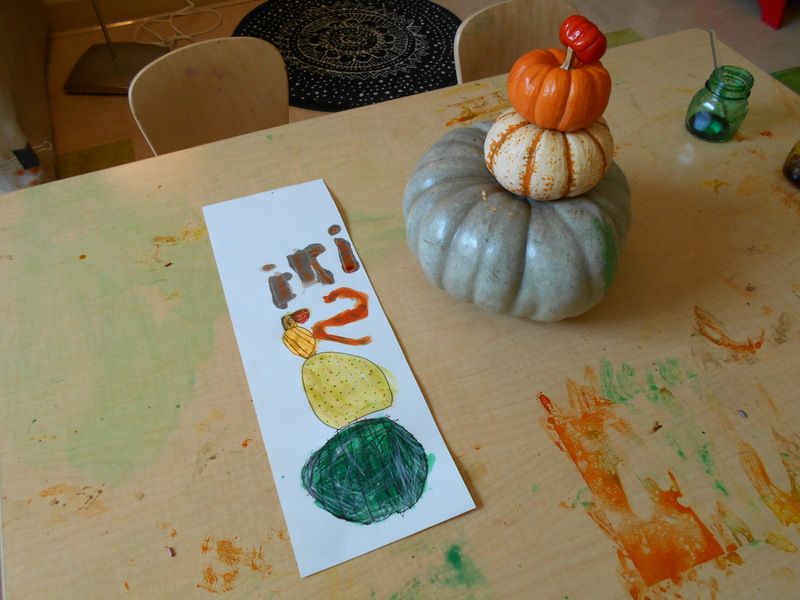 Siena: The red pumpkin on top looks like a hat. 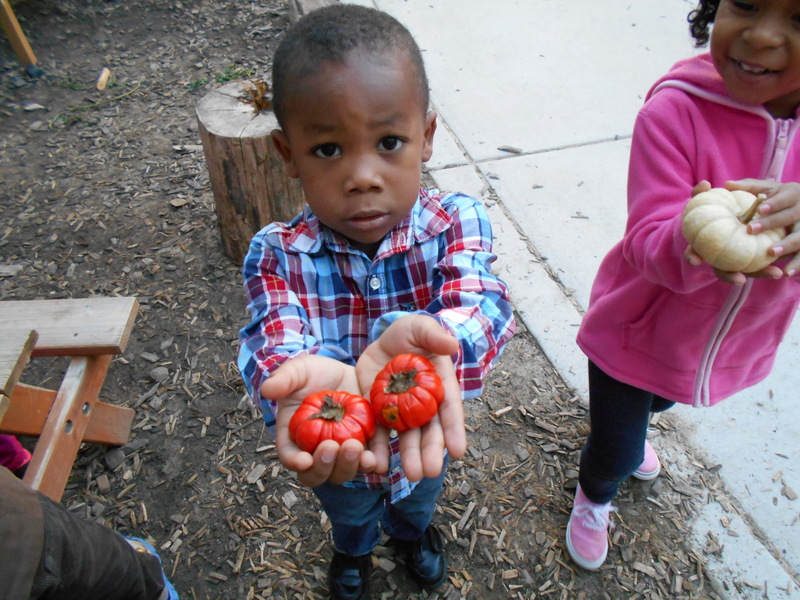 Miguel: I like these pumpkins. They are all different sizes but I like the little one the best because it’s like a baby. 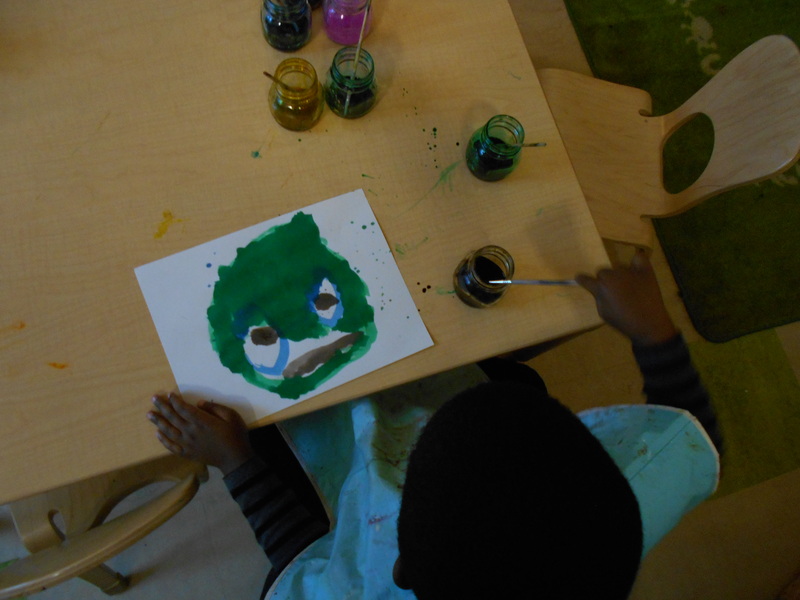 Next, children used liquid watercolors to paint over their pumpkins. 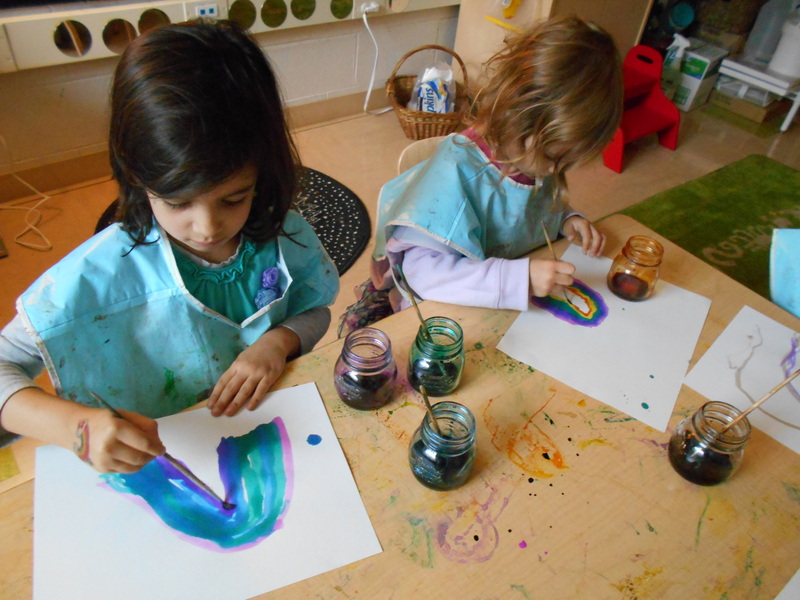 Friends were excited to see that they could still see their crayon drawings and enjoyed watching them emerge through the paint. 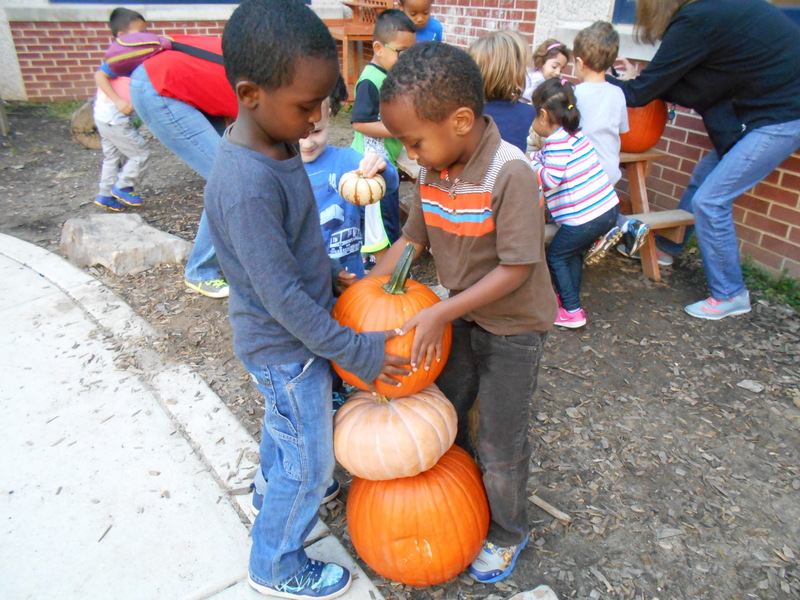 Ra’Maya: I can still see the dots on my pumpkin! It’s like the paint disappeared in the paper. I think it went to church. Waju: Hey, I remember these! 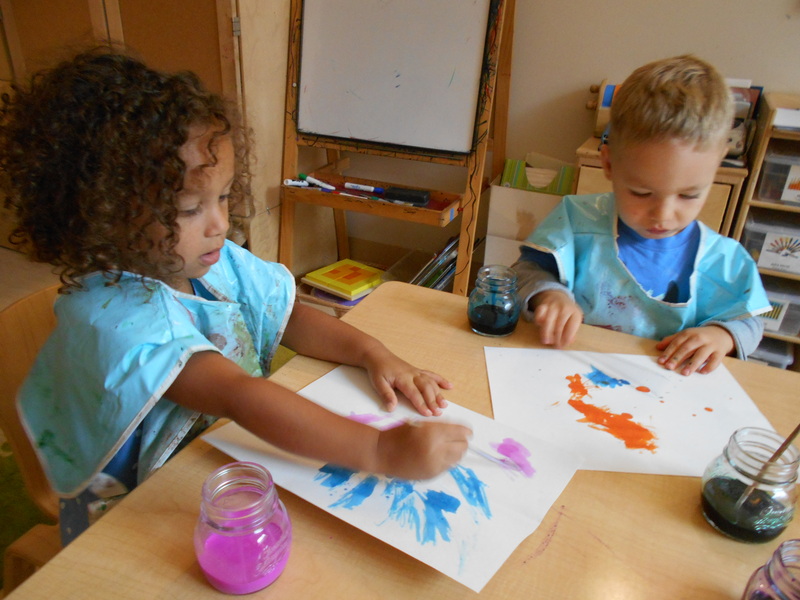 They are water paints! 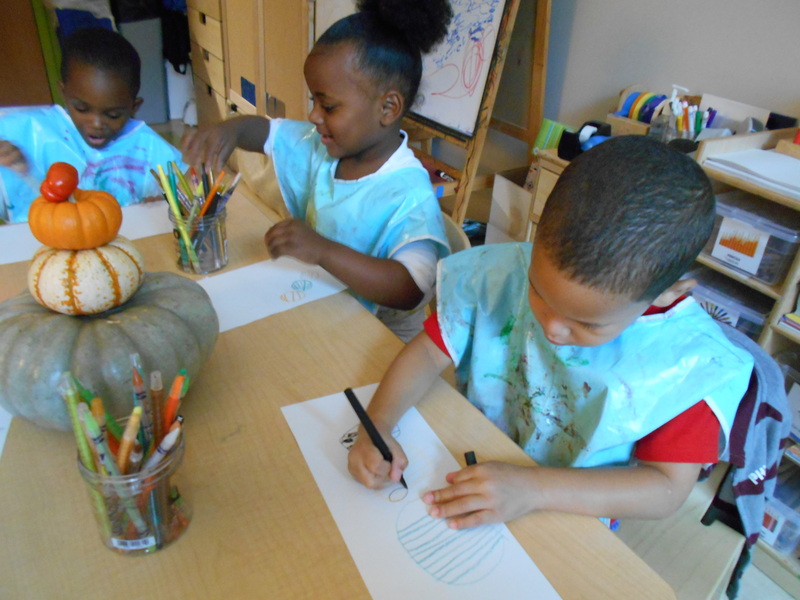 Dai’Jah: I can still see all the lines on my pumpkin. And they were skinny.